1. Do not believe anything they tell you. In fact, they will actually lie to you – well they did to me and I still just cannot believe how I was treated by this company. When I signed up for the service I was promised 1 year of HBO/Cinemax for free – nothing I care about but it was promised to me. I asked the person on the phone several times if this was for the year and she said yes. Keep in mind I actually said ‘this is for the full 12 months of my contract’ and she said yes. I asked this question like 2-3 times just to make sure that I understood correctly and she wasn’t giving me one of those 3-6 month deals that would end and increase my bill. Three months later I realize my bill jumped $50. So I call ATT and they say there is nothing they can do. I ask them to listen to my previous phone call (as they record them) and they said they would and get back to me within 5 business days. I thought great, they dont believe me but once they listen to the call I will get what they promised. 7 business days with no phone call from ATT I call them up and they apologize and tell me a manager would listen to the call asap and get back to me. 7 business days after this with no call I call again. I am told that no one is going to contact me and that even if this person promised me a free year of HBO/Cinemax that the company was NOT going to give it to me. Wow. ATT will be dropped very soon for this. Customer service gets an F.
2. Internet – I pay for up to 18mbps. I average around 6. This is terrible. No way on off peak hours should I be getting such terrible internet. My recommendation – Avoid uverse like the plague. Comcast isnt much better but they never lied to me and my internet was always around 13mbps when I paid for 15. So what have I done? At this point I had to drop a bunch of services that were promised to me in order to keep my bill at the original cost. A real bummer. I had high hopes when I heard of Uverse but its a real let down. Oh well at least people now know not to sign up with them. I think the best thing to do is to cut the cord altogether. Have you wondered how to perform a task analysis? What it is? Why its important? If so then this post is for you. I have tried to break this down into very simple parts so that anyone can create a task analysis. After a needs analysis (ie learner analysis, context analysis, technology analysis etc.) and needs assessment/gap analysis are completed and a training need has been confirmed, a task analysis is conducted as a quality check. This is performed to help ensure that all content/processes needed in the training are present so that objectives, content, and assessments can be created. This ensures that once objectives are created that you are not missing anything (as in everything the learner needs to know). It also ensures that all content is taught in the correct order. For example if you were teaching someone how to drive a car you wouldn’t teach them about making a right turn at a red light before teaching them how to do things like turn on the car, use the brakes, and use the gas. Thus this is a very important step that if missed or done incorrectly could cause you to design training that does not address everything needed causing unhappy clients and workers that cannot perform their expected tasks. So even if you are in a hurry and doing rapid instruction you STILL need to do a front end analysis and task analysis. Sorry there are no shortcuts here. Now surely you can do parts of the task analysis and begin design but you still need to do it. The task analysis is where you organize your tasks into high/low level knowledge and/or processes, which helps determine what kind of instructional strategies, media, and assessments are appropriate for your training. For instance if you find that you do not need to design instruction for low level knowledge (ie facts/concepts) because your learners are experts you might only use problem based instructional methods during design. However if you do need to design instruction for those low level tasks then you would probably want to add some form of direct instruction in order to teach those low level concepts and then move onto other strategies once learners have mastered those facts/concepts. To conduct a task analysis (after doing your gap analysis) you should do the following. Keep in mind that usually steps 1-4 are done simultaneously. 1. Determine what content/skills/processes need to be trained – You can gather this via observation, document analysis, working with a SME, interviews, surveys, etc. 2. Determine what kind of content you have (and it might be multiple types requiring multiple analyses) – Is it hierarchical? Or Procedural? Or both? At this point I can start to figure out what type of analysis I will be doing and how I will need to organize this content. I can also start thinking about my design (instructional strategies) See the example below with both types of analysis and how they can and are combined together. c. You need to decide which content to include. For instance you may only want your training to be 1 hour and not 3 required for all content. This helps you determine what can be cut. d. If you are going to train everything this is still useful as you can determine what you should focus more of the learners time on. 4. Break the content down into simple steps/tasks – how far you break them down is up to you and your SME. This requires a SME and other data collection techniques described in step one. So are there different types of tasks analysis? Hierarchical task analysis focuses on the content that needs to be trained. So you actually teach from the lowest level knowledge to get the learner to the final goal. In the procedural task analysis you teach from the start to the end of the process (ie focus on the steps). In the hierarchal example provided you can see how the problem is broken down into rules/procedures, concepts, and facts (verbal). This type of task analysis breaks the task into a hierarchy so one would know that they first need to teach the facts/concepts before showing the rules and procedures. Note that you can and usually do need to combine these analyses. The example provided does just that as some steps in the hierarchal need to be broken up into their processes. Thus you might have done several or more analyses for the one training application. Also note that you should always provide assumptions and expectations in your analyses at the end or in the document (ie learners can use a computer, mouse, and keyboard and steps 1-4 need to be trained before steps 6-8). How far you break these tasks down is up to you. For instance, you might assume your learners can read, can use a computer, etc. Sometimes they may not. And this should all be identified in your learner analysis and then carried into the task analysis. 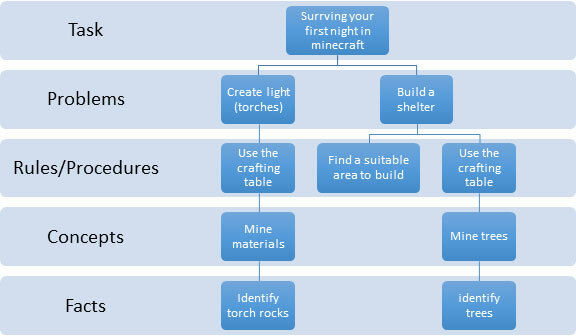 Example: The task here was to survive a night in minecraft. For this task I had to create a hierarchical chart so that I knew the order to present the content and a procedural analysis so that I knew the steps to ‘use the crafting table’ and knew exactly where that process should fit into the training solution. Normally your content will not fit as neatly as mine does – but this is an example and should be neat. They can look very complicated as more tasks are added. Also note that some authors recommend putting your tasks into performance measures such as ‘demonstate building a shelter’ whereas I just wrote build a shelter. Either way is ok as long as you understand the tasks. This could vary by project. The next type is procedural. Thus information is not put into a taxonomy format (ie facts first, concepts 2nd) but rather it is taught from the beginning of the process. This is the procedure used for using the crafting table which needs to be taught according to hierarchical analysis above. Please note that I am just showing the process here. If you going to do a process map you would need to use different shapes for starting, choices, and steps. I just used all rectangles here because I do not have process mapping software on my machine. Now there are other types of task analysis that you will see throughout the literature however they can fit into one of the two analyses above and thus I do not see a reason to define them further as I believe this just confuses the designer. Essentially any activity you generate will fit into the hierarchal or procedural analysis (ie cognitive/information processing and if/then).